Odds on beer can 555 yards, cold bore. Your your odds on a beer can at 555? Cold bore, 1 shot only. Thinking of doing a challenge for some friends and I the next time we shoot. Most of the guys shoot 6.5. My range is pretty short so I shoot 223. I was just curious at what everyone else thought. fairly healthy wind? Not good..
How many ounces? Beer cans exist in many different sizes lol. Single can? Not good odds. That's a slim target by any stretch. I could hit it though, pretty easily..........if it was part of a 30 pack. .5 MOA on a beer can at that distance. No wind, probably could pull it off cold-bore or otherwise. Not bragging by any means, just don't think it would be that difficult in the grand scheme of things. I am talking zero wind here. 12oz roughly 2 1/2 x 4 3/4. There will be no beer wasted here. And it's fairly windy here. The thing about challenges though is someone there has to be able to pull it off - usually the person initiating the challenge. Otherwise it's sort of moot. Honestly it would take some luck for me to hit it. Meh...in wind I give it 25% 1st round. I practice head shots as my cold bore @ 600 yards all the time. I am about 50% on the 6" head with a 6.5 creed so I'm halving that. Don't forget about the best part, to the victor goes the spoils. Like a twelve pack from each of the other competitors that doesn't connect with the target. Put it at 800 yards, I got this. But a normal size beer can? I feel like there would be a decent amount of luck involved. Would need to do it two or three times in a row to say it wasn't just by chance. Of course, who wants to sit and drink said beer by themselves when you can share it with friends and rub the victory in a little. Will be an ongoing pot if nobody connects the first day. Maybe $5 -$10 a shot kinda deal. Ok so how do we officialize this? What if I or someone else goes out to give this a go and records it all? How do we make sure it's legit and there no rounds fired before as if "For practice" or whatever??? Would be our first shot of the day, we shoot 1st and 3rd Sunday of the month at my range. I'm asking like if I want to give this a shot. I'd probably have to record and post the recording on here. How would you all believe I'm not lying on my video or that it was staged? Would this be an online contest for sniper's hide members? Idk where your range is but I'm sure it's too far for me or others to go. This was a pay the pot for every shot game about 15 years ago at a ranch house we stayed at during our annual varmint hunt . Yardage was not disclosed, rangefinder not allowed. Rock Chucks were the target. Actual yardage was 710 yds. This is my brother shooting his Olympic Arms K8 .243WSSM from the driveway of the house. The challenge and trash talking associated with it was an absolute blast. Give it a shot. I was just wondering what others thought their odds were. Something I was thinking about doing with friends, not a online contest. It just seems like something fun, I figured it'd be cool if there was a way to make this official some way. Definitely will give it a try when I get the chance. Jacob Bynum of Rifles Only used to do the Dos Equis challenge as a match stage. Bottle of Dos Equis sitting on the top of a 4x4, shooter prone at 400. One shot to hit it. If you hit it, you get a case of beer. If I recall, there were 11 or so hits average, out of 70-90 people. I'm going to try on the next range trip. I can get 530 at my close shooting spot. Texas windy and foliage and terrain have super switchy winds. I'll have my 6x47 on it. Avatar is CCBS @ 600. How many have rifles that will actually group inside a beer can at 500+ yards? If yours won't then it is no test of skill. Can you turn the can sideways? Try the Carlos Hathcock challenge....a chicken egg at 600. Dont remember where i read about it, but i always thought that would be good for kicks. or the quiqley challange https://www.quigleymatch.com/ if you owed a sharps. The egg seems almost impossible, the beer can or bottle still impossible for me. When we get to watermelons let me know. Not saying I could hit it cold bore but it would be easier for me to see at least. Can you turn the egg sideways ? Or the late and great Bob Munden, I allways liked watching his exhibition segment. The one were he shot a chicken egg at 200 yards with an iron sighted 44 mag was a good one. Definitely wasn't a first round hit but still pretty damn impressive. Last Oct. I shot this at 500 yds during a class at Front Sight. I don't remember what the winds were. Could I do this every time? No. But given a few chances, I might be able to get maybe 30% first round hits. Any decent shooter with good dope would have a fair chance of hitting the beer can. BTW, I am NOT a good F-Class shooter. This sounds like fun! But, here in a negative DA where the wind howls, that can of suds is relatively safe outside of luck. I give it less than a 20% chance. 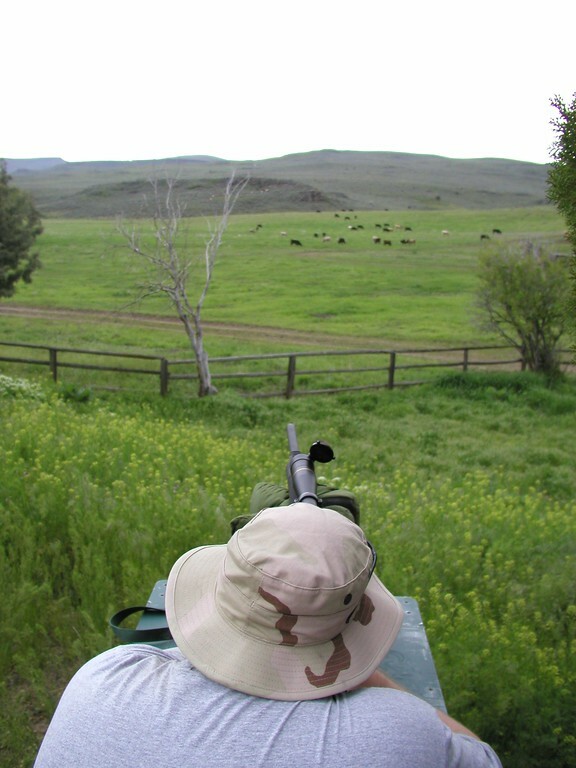 I shoot to 500m at my range often and there is usually no wind so I would say 50% chance. If I tried it anywhere else that actually had crosswind then 25% for a first round hit. I will give it a shot next weekend but not use a beercan they would get upset. I'll offer this, I have a cousin in MS that can shoot a soda can at 300 yards free hand. Last time I saw him do it was with a 7mm STW and on the first shot no less. I should probably say could, he's been pretty strung out on dope the last 15 years. Then he can probably hit 3 cans with one shot, and that's before he "works" on the rifle. It's such a shame what dope does to people. Pretty sure I couldn't do it. But Mark did according to this video. I mean he does say luck was definitely involved. And he did bring 4 bullets. A man deserves a fresh steak after a hard day of hunting. Numerous beers did die that day, respectfully, we served bourbon at their wake later in the evening. I think it would be a lot of fun for you guys. A lot of time, we just get to the range and shoot. No wonder it gets boring. Make the challenge in time for everyone to do a little practicing. Then it gets fun when you all get there and have a go at it.